In a recent BBC News story Anna Harvey, head of vinyl at independent label Silva Screen Records - not Silver Screen as in the the BBC story - explained that to reduce plastic waste her company is using paper bands instead of shrink wrap to hold the vinyl and its sleeve together, a concept that it hopes to extend to CD and DVD releases. The BBC story fails to note that Anna is the daughter of the late and iconoclastic composer Jonathan Harvey. In a 2010 interview with me Jonathan called on classical music to abandon its stuffy conventions. He was talking about specifics such as the big divide between amplified and non-amplified music. But it can be argued convincingly that a refusal to recognise classical music's environmental impact is another convention that urgently needs challenging. As a previous post here pointed out, the Far East, and China in particular, is the new 'go to' destination for orchestras. The aviation industry depends entirely on fossil fuel and consumes a staggering 5 million barrels of oil every day; that is 2.5% of total carbon emissions. A plane flying from Europe to the Far East and back generates 4.5 tonnes of carbon, which compares with average per capita emissions globally of around 1 tonne. This summer the Boston Symphony Orchestra will fly 6538 miles to perform Mahler's Third Symphony at the BBC Proms - the works third Proms outing in five years. The orchestra's return journey will release greenhouse gases equaling around three tons of CO2 into the environment. Of course orchestras need to tour; however, with very few exceptions classical music refuses to recognise its environmental impact by, for example, introducing carbon offsets. The Festival d'été de Québec aims to be carbon neutral by offsetting all greenhouse gas emissions generated by the event. If a rock festival in Canada can do this, why, for instance, cannot the BBC Proms? A 2010 study by the University of Surrey reported that the UK music industry's activities generate around 540,000 tonnes of greenhouse-gas emissions. Audience travel accounts for 43% of those greenhouse-gases, live venue music events accounted for 23%, and music recording and publishing 26%. Major culprits for greenhouse-gas emissions are CD manufacture and packaging, and doubtless digital evangelists will argue that this is another reason for ditching legacy media such as CD and vinyl. But this is not the case. Music streaming performs no better: The energy appetite of the server farms that power music streaming and other online services is another environmental blind spot. Technology applications account for around 7% of global energy consumption, with a Greenpeace study identifying Amazon Web Services and Netflix as being particularly inefficient users. In 2014 US data centres consumed about 70 billion kilowatt-hours of electricity; this was 2% of the country's total energy consumption, and that consumption is increasing exponentially as more and more activities migrate to the 'cloud'. Abandoning shrink wrap on vinyl releases is a small but significant step forward. Classical music suffers from a severe case of tunnel vision. Some iniquities, such as correcting gender imbalance, have quite rightly become cause célèbre. But others such the environmental impact of classical music are conveniently overlooked; because they challenge the profligate jet set culture of the art form. Denying the environmental impact of classical music is a silly classical convention that should be much higher on the change agenda. 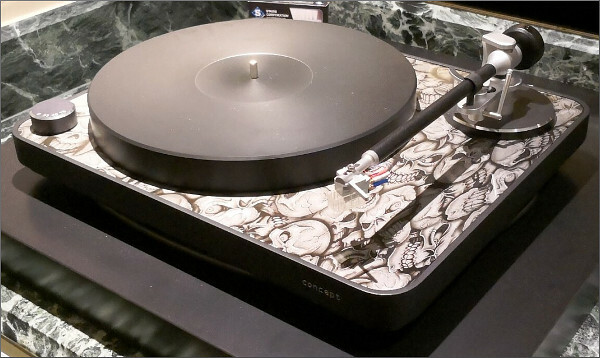 Header image is Clear Audio's Skull concept turntable. New Overgrown Path posts are available via RSS/email by entering your email address in the right-hand sidebar. Any copyrighted material is included for critical analysis, and will be removed at the request of copyright owner(s).